This story opens up with America becoming a new country and our first president, George Washington, needing a home. It then begins describing how the slaves were put to work to build the White House. 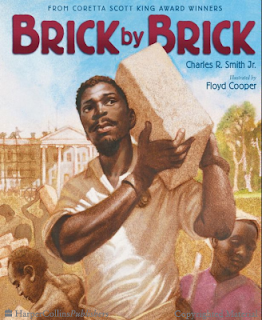 Through text and illustration, "Brick by Brick" tells the story of how slaves worked under the blistering sun for hours upon hours. Many nameless and faceless slaves worked until their hands bled and cracked, only to receive absolutely nothing for their work because slave owners would take their pay. The book ends with the slaves trying to learn new skills, such as how to use a drill or chisel, so they can possibly earn a shilling or two. This gives them hope that one day, maybe they will no longer be someone's property. This element allows teachers and students to explore different issues of social injustice. This book tells the story of slavery and the social injustice that many African Americans faced during that time. They were made to work many hours a day with no pay. Instead of them being compensated for their work, their owners would take their money. This book raises awareness and educates students on how African Americans were treated during those times and how wrong that treatment was. This book is very informative to students and can definitely create many classroom discussions. I would first start with a read aloud of the book, and then move into a discussion on why they think slavery is wrong. I would ask them to name some things they found wrong/hurtful in the book and then they can either write a short essay (or draw a picture, depending on grade level) of what they would have done different if they were the president of the United States during that time.